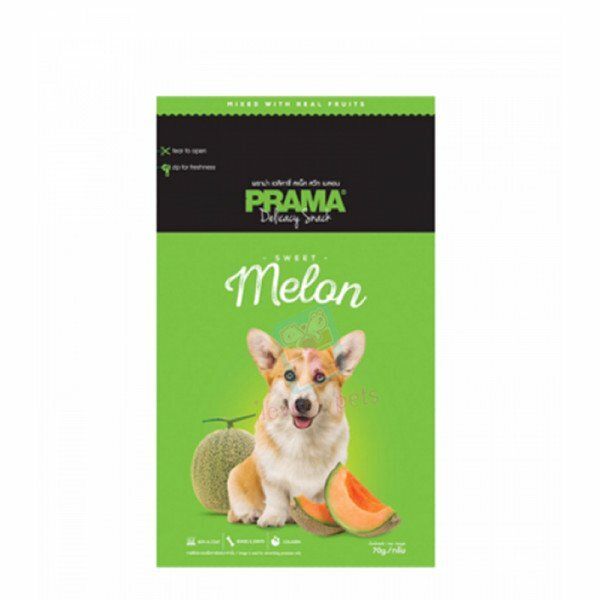 Features:Prama Fruity series will leave your dog's yearning for more. Infusing a variety of fruity flavour in perfect proportion to ensure your canine's desires and appetite is met.Made from fresh chicken meat and carefully selected exotic fruit. Thi..
Prama Fruity series will leave your dog's yearning for more. Infusing a variety of fruity flavour in perfect proportion to ensure your canine's desires and appetite is met. Made from fresh chicken meat and carefully selected exotic fruit. This snack is designed to boost both your canine's health and immunity whilst exhibiting a fresh and fruity aroma. - Made with real fruits. Chicken Meat, Tapioca Starch, Wheat Flour, Sorbitol, Soy Protein, Glycerin, Wheat Gluten, melon, Artificial color, Salt, Preservatives. Feed as a snack or reward to dog, aged over 3 months. The package is resealable with Zip Lock Bag Package for your convenience.